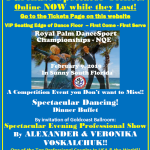 Click Here Join our USA Dance Royal Palm Chapter # 6016 Online Now! » It is Easy! Please Save the Dates for our Next Competition! Click on the Flyer below to print it as a PDF document. 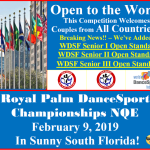 We look forward to seeing you at the 2020 Royal Palm DanceSport Championships NQE & WDSF Open!! 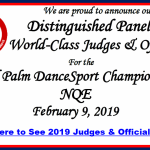 Photos now posted and available to view and purchase from our 2019 Royal Palm DanceSport Championships NQE and WDSF Open! 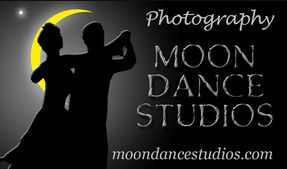 Go to Moondance Studios Website. Please Click on the Link above or on the Image below to find your pictures! 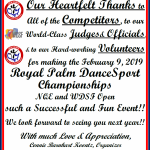 Our Heartfelt Thanks to all Competitors, to our World-Class Judges & Officials, and to our Hard-Working Volunteers, for making the 2019 Royal Palm DanceSport Championships NQE and WDSF Open the Very Successful and Fun Event that it was!! Breaking News!! – Standard Rate Extended for 1st 10 Adult Amateur Couples to Register after January 12!! Breaking News! 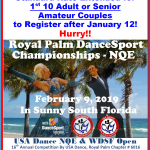 Due to last minute demand, and in appreciation for the overwhelming response to this Exciting First NQE in Florida, we have extended the $145 Adult Amateur Standard Rate for the First 10 Couples to Register after January 12! Hurry! Note: We have added Under 21 Championship! Ticket Purchase available online until January 26, 2019 (Midnight). Hurry! Hurry!! Buy Your Spectator Tickets Online NOW WHILE THEY LAST!! Hurry!! 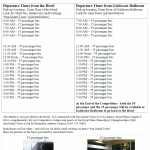 – SATURDAY, JANUARY 12 (Midnight) – Hotel Group Rate ENDS!! 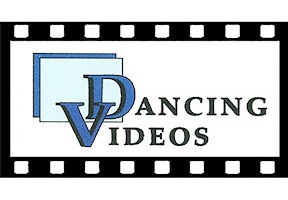 – & Competitor Fees GO UP!! – Book Hotel NOW! 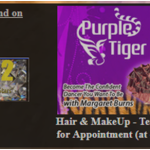 – Register for the Comp NOW! Click Here to Book Your Hotel Online NOW! Click Here to Register for the Competition Online NOW! Note: Under 21 Events are found under the Amateur+ division in O2cm. 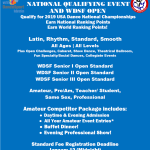 Happy New Year Gift from Royal Palm DanceSport Championships NQE and WDSF Open!! Happy New Year!! 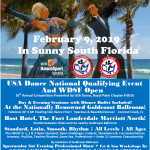 As an expression of our appreciation for the overwhelming response received for this Exciting First NQE and WDSF Open in Florida, we at the Royal Palm DanceSport Championships NQE, February 9 in Sunny South Florida, are offering a Special New Year’s Gift!! See the Flyer below! As of January 25, 2019: We now have 22 Couples Registered, leaving space for only 2 more Couples in this Event! 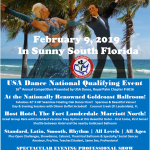 Contact Alexander & Veronika directly at (407) 881-7621 or Info@RoyalPalmDanceSport.org if you are interested in Lessons or Coaching with any of our Adjudicators or Officials on Sunday after the Competition. Due to Overwhelming Response – All Events Limited to 24 Couples! 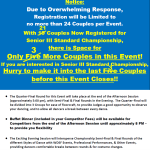 – Space for Only 3 More Couples in Senior III Standard Championship!! – Hurry!! Update: As of January 11, 2019: 21 Couples Registered; Space for only 3 More Couples! GROUP RATE ENDS JANUARY 12 (Midnight)! 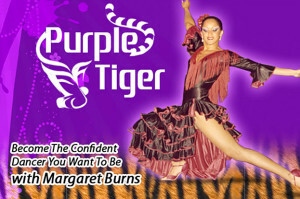 Reservation must be made BEFORE JANUARY 12 (Midnight) to qualify for this Great Group Rate!! Rates revert to Standard Hotel Rates after January 12 (Midnight). 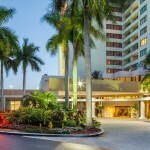 More Images below Group Rate of only $179.00* (for 1 King or 2-Queen – Double or Single Occupancy room)!! Register Now » Our Entry List is Growing Fast!